The housing protest against exorbitant rental rates and a lack of small apartment construction for students and young couples that began in Tel Aviv, has spread across the nation. 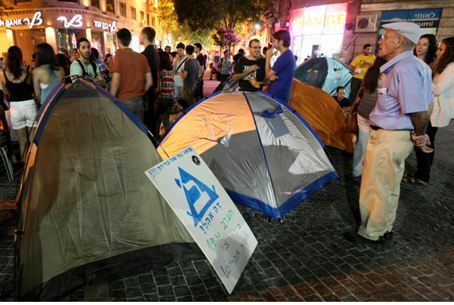 Protest tent camps have also been set up in Jerusalem. The demonstrators want more housing solutions but also easier mortgage terms. The activity was spearheaded by college student unions, joined by the movement for new Zionist initiatives, the right-wing ‘Im Tirtzu’, best known for its campaign against the New Israel Fund's anti-Zionist NGO's and sources of funding. ‘Im Tirtzu’ has announced that the radical left wing-affiliated New Israel Fund and its satellite organizations are now behind the housing protest. They claim that the protest leaders are associated with the fund. They quote Protest coordinator Lonny Nathanson who reported to Galei Tzahal radio that the large demonstration tent camp was built with donations from the New Israel Fund. The ‘Im Tirtzu’ website says that the movement will provide emergency financial support for the housing protest in the peripheral cities around greater Tel Aviv. That statement served to cement the doubts of "Im Tirtzu" as to the politically inspired roots of this protest, whether its subject is justified or not. The housing protest became another instance of innocents being duped by those with a political agenda, in this case causing as much unrest as possible while Israel is under a Likud government. The ‘Im Tirtzu’ movement therefore decided to abandon the struggle and act in alternate channels to negotiate directly with the government to resolve the housing issue.